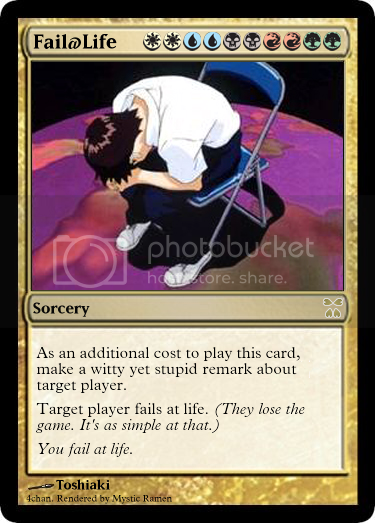 Anime… Magic The Gathering Cards?! I used to play Magic The Gathering (oi, stop laughing! ), so these random cards I’ve seen dotted round the net made me giggle! Has anyone seen any more? 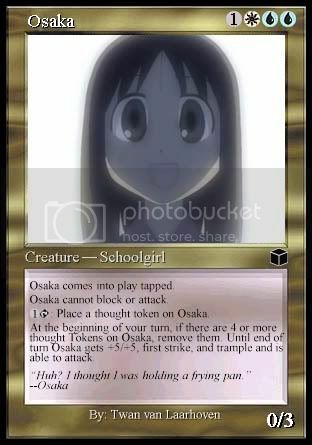 :) I’d love to have a weird anime themed MTG deck, not sure if it exists though. A Mushishi deck would be cool, it could have weird rare mushi cards that do strange things to the other player’s creatures! Oh wow, just found a programme where I can make my own set…must…not…download…I’d make an Ebichu deck first (I can see it now, I tap my ice cream and put two counters on my Ebichu creature)…then an Animal Yokocho deck to play against…The Magic Set Editor is here! Each player chooses and sacrifices half of his creatures, loses half of his current life and sacrifices half of his land. Psycho Loli may not be blocked by any creature with a power greater than 3. LOL this is hilarious. ‘specially the [email protected] card. Weird!! but cool real cool! !